I am a big believer that kids do not need "things" as much as they need experiences. They can have all the "things" in the world and know nothing about the world around them. I also think that sometimes having "things" makes you stop examining the world around you! Of course, experiences take time and effort, and don't always produce that immediate reaction that a gift of "things" provides. Nonetheless, I will keep trying to find new, fun ways to expose my children to as much as I can. I am going to dedicate today, and maybe a few other days to some of the cool stuff they kids and I did this summer. 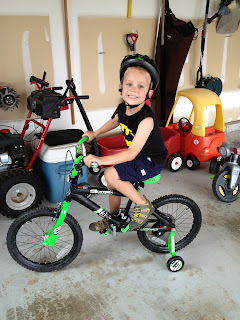 For starters, K-Man learned to ride a bike! This was a big milestone for him, and he is having a ball. I remember many years ago being questioned as to why he didn't ride, or why he didn't pedal on the big wheel he had. Even in 3 year old pre-K, they were "concerned that he didn't ride a tricycle. The answer plain and simple was that he wasn't interested. There was no sense in buying a bike for saying we bought him a bike. The point was for him to want to. The day we brought this home, he immediately rode, no problem. I am guessing, he was just ready. We won't talk no training wheels yet, but I really think he could if he wanted to. Hey, it has only been 3 months! I think we will let him enjoy it! Mini-Me rode her first horse, okay, pony, but to her, that is a horse! We stopped at a local community picnic one day and they were offering pony rides. I have to be honest, I was shocked that either child wanted to do it. K-Man is traditionally cautious, although he has ridden before. Mini-Me though is FASCINATED by all things animal. But they both stood anxiously in line for their turns. She doesn't look that excited in this picture, but you can see her and the horse. The first few I took, she was smiling so big, you couldn't see her eyes :). To this day when anyone calls to talk with me, she wants to talk, so that she can say "I ride a horsey!" I think it made an impression. 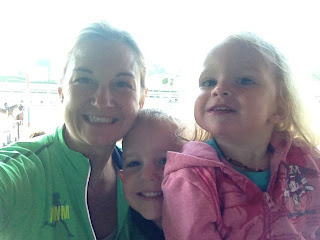 While we are on the topic of horses, I will round this post out with our trip to the Saratoga Race Track. We have gone every year since moving here. Actually, we hosted Mini-Me's first birthday there on a sweltering August day last year. The season is short, late July until Labor Day weekend, so time is limited to get it in around all your other summer activities. I wasn't sure about corralling them both during actual betting time, and have always heard about having breakfast there. The track offers a breakfast buffet, or you can take your own and sit in the boxes trackside watching the horses warm up. After the K-Man woke up one morning, I said, ok, get dressed and packed breakfast to go. I am SO glad I did this. It was a great morning for me and I think them. You park right at the track and pay $10. If you leave before 10AM, you get your money back. Since there is only so much to do during the warm ups, that isn't really a feat. We started out up in the box, as you can see from the picture above. Mini-Me entertained those not listening to the announcer because she too announced every horse that went by, but with "I see one, Mommy!" We also took a little trip to the rail where you could see the horses a little more up close and personal. I really this might have been one of my favorite moments of the summer! PS. Click on the link for the race track, it has got a great history. Oldest running sports venue of ANY kind in the US!